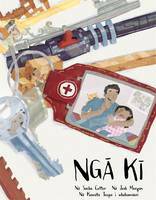 "This is the te reo Maori version of the children's picture book Keys by Sacha Cotter, illustrated by Joshua Morgan. In this picture book, as Dad tucks his daughter into bed, he tells her fantastically imaginative stories about the keys on his key ring and what they unlock - from... read full description below. "This is the te reo Maori version of the children's picture book Keys by Sacha Cotter, illustrated by Joshua Morgan. In this picture book, as Dad tucks his daughter into bed, he tells her fantastically imaginative stories about the keys on his key ring and what they unlock - from a zippenburger that takes him to work, to a rocket to collect space noodles, a treasure box in the jungle, a chocolate biscuit factory where he taste tests all the biscuits, and a paddock where he rides a woolly mammoth that only eats yellow food"--Publisher information. Sacha Cotter is a library assistant with a Graduate Diploma in Teaching and Learning, and she has taught in New Zealand and Spain. She has completed several film courses, and her screenplay Wasabi Peas was a semi-finalist in the LA Comedy Shorts Film Festival 2013. This is Sacha's first book. Joshua Morgan is an illustrator, writer and designer who has a BDes in Illustration from Massey University and has worked on picture books, posters and album covers. He works with pencils, paints, textures and Photoshop to make picture book illustrations that recreate the wonder of childhood.